I will admit that lately I have had quite an obsession with vintage Christmas collectibles and of course vintage blue birds. 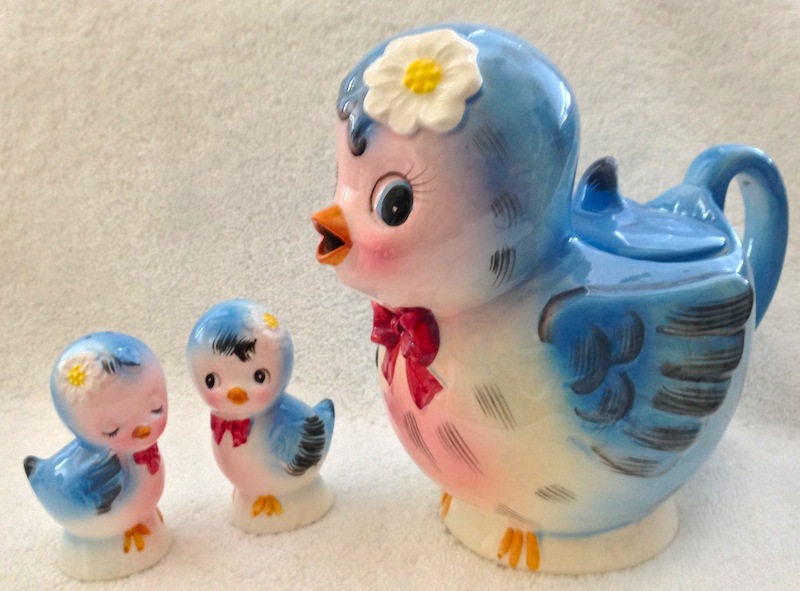 The blue birds all started with a 1950s blue bird sugar jar I acquired more than a year ago and she was so cute with her big eyes, sweet face and flower in her hair that she was nicknamed ‘sugar chick’. I sold that sugar chick and then as time went on I really missed her and wished I would have kept her thus starting the obsession with finding another one. 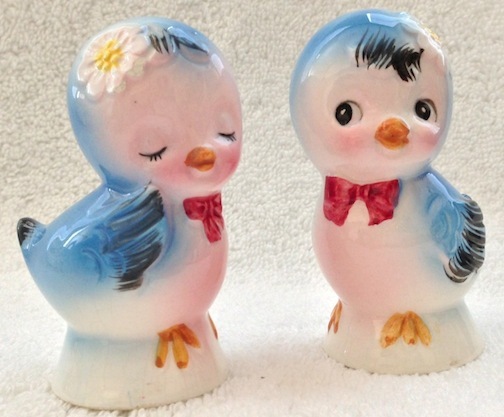 Over the year I was able to slowly find pieces from that same line and have managed to get my sugar chick back, matching creamer, teapot, and just this week the salt and pepper shakers. I have seen a cookie jar that belongs to the set so, I will keep an eye out for that. I am including a picture of my blue bird salt and pepper shakers and the blue bird teapot. Now, onto vintage Christmas. I have always loved vintage Christmas collectibles from 1940s-1960s. The collectibles from the era might be referred to as ‘kitschy’ by many folks but to me, they have loads of charm and add that ‘special something’ to the holidays. So this year, I made sure to start my collecting early in the summer and have been able to add some amazing pieces (I will add pics soon) that include the vintage Lefton Candy Cane Kids, Lefton Christmas Girl Bells, Napco Christmas Headvases, Napco Angel Figurines, Napco Shopper Girls, Holt Howard Christmas Salt and Pepper Shakers, Holt Howard Pixies and of course the Lipper Mann Noel Candle Holders. 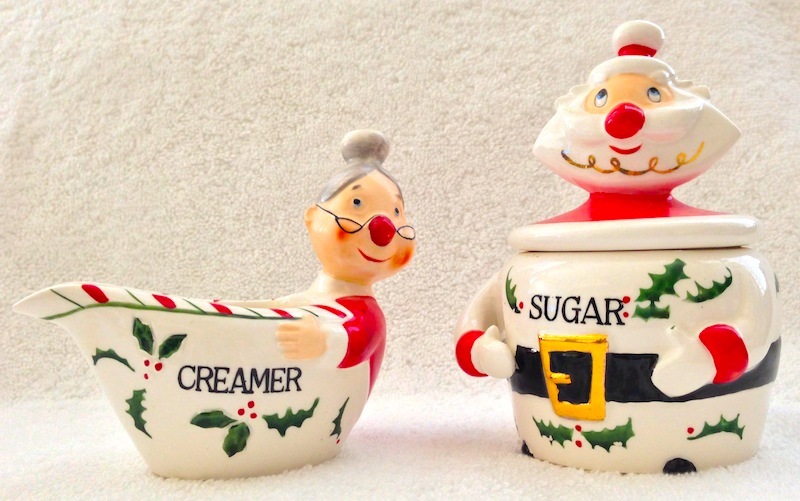 Here I have included a picture of a vintage Christmas Lipper Mann Santa Claus & Mrs. Claus Sugar and Creamer set; I love their giant red noses and sweet faces. What are you all collecting these days? I would love to hear from you!! You can vist and find our newly listed items and collectibles at: Crazy4Me Ebay, Crazy4Me Etsy, Crazy4Me Rubylane.